As one former Manchester United manager so succinctly put it, “Football, bloody hell”. Despite their recent record at Old Trafford – where they have now won three of their last five games – and despite the green shoots of recovery against Swansea last weekend, nobody really gave Albion a chance in this game. United were coming off the back of a stunning victory over their arch-rivals in the derby and they knew defeat at home to the bottom club would hand Manchester City the title in an even more humiliating way than the one they had avoided. Albion, meanwhile, headed up the M6 with more managers than league wins to their name and no away victory in the league in eight months. They were as long as 20/1 to win with some bookmakers, they weren’t given a hope. But Darren Moore and his coaching staff hadn’t read the script. Albion’s caretaker boss went to Old Trafford with a simple but effective plan. By playing an orthodox 4-4-2 formation with players in their preferred and natural positions, he made the Baggies tough to break down. Without the ball they were tight and compact, but when they had it the wingers – and in particular James McClean – found the touchline and stretched the pitch. Moore’s back to British basics approach may not be fancy, but it is working because everyone knows their jobs like the back of their hand – they’ve played these roles since they were little. 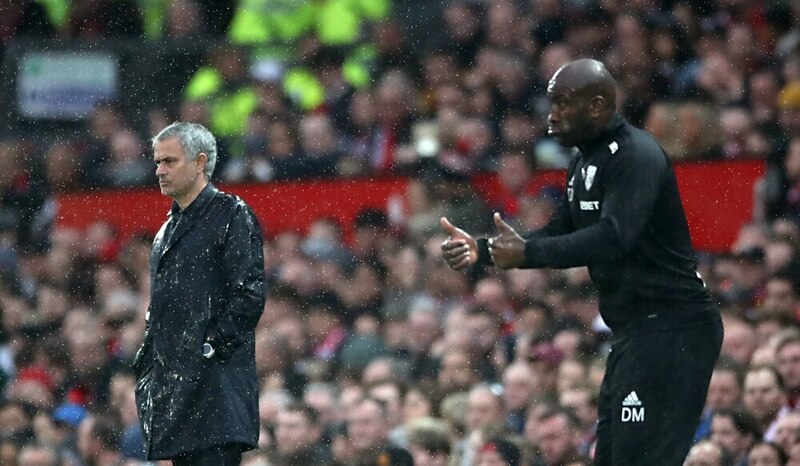 After the game Jose Mourinho said: “We were masters in complicated football. Everything was complicated.” Albion, meanwhile, kept it simple. The concern was that they would be overrun in midfield as they have been before this season with two men up front. But the brilliant Jay Rodriguez dropped back into midfield and helped out when necessary, epitomised by his early dispossessions of Nemanja Matic and Ander Herrera. It wasn’t just tactics though. When Moore was asked after the game, how he did it, how he turned this team of perennial losers into a squad capable of beating the second-best team in the country, he answered with ‘togetherness’. It is a sentiment that has been echoed by his players. This is the other side to Moore’s success. In his own calm and determined way he’s galvanised a group who have been lost this season, struggling for inspiration under Tony Pulis, struggling for direction under Alan Pardew. Moore may not be very experienced as a coach, but he knows how to treat people well, and ultimately that is a huge part of management. So far, he has got everything spot on. Two games is not enough of a barometer to judge a coach, but keep this up and he will emerge as a genuine contender for the permanent job. For his part, he continues to play a straight bat to that question, insisting he is only taking it one game at a time. Relegation has been delayed for now, and the 0.01 per cent chance of staying up has grown to 0.1 per cent. The infuriating thing is that it needn’t have ever got this far. With the benefit of hindsight, the decision to delay sacking Pardew will cost Albion their Premier League status. Moore, and to a certain extent Gary Megson, have proved this season that you can get a tune out of this squad. Albion are nine points from safety with four games left so staying up is still incredibly unlikely. But what Moore has done along with goalkeeping coach Neil Cutler and under-23s boss James Shan is ensure that this team will go down fighting. That coaching team is giving the club a platform for the summer ahead and for that they deserve immense credit.